Charles-Valentin Morhange - he changed it to Alkan, his father’s first name - was destined for great things. A child prodigy, he entered the Paris Conservatoire at six, and his Op. 1 was written when he was just 14. As a young man ‘the celebrated Alkan’ was popular with Paris’s salon set, rubbing shoulders with the likes of Victor Hugo, George Sand, Chopin and Liszt, but he withdrew from public performance in 1849, only reappearing briefly to play at the Erard showrooms. Alkan was certainly one of the great virtuoso pianist-composers and his keyboard works must be among the most difficult ever written - even Liszt admitted as much. But this ‘Berlioz of the piano’ disappeared from the repertoire until fairly recently, when some of the most accomplished pianists – Hamelin among them – brought the music back into the public domain. Hamelin has already recorded some Alkan as part of his ongoing partnership with Hyperion (CDA66794, 67218). Indeed, the company must be commended for their single-minded pursuit of the more obscure keyboard repertoire (witness their multi-volume Romantic Piano Concerto series). This new disc comes freighted with all sorts of awards and commendations and it’s not difficult to see or, more accurately, hear why. This is fiendishly complex music and few pianists could ever hope to tackle it with any success. It’s a measure of Hamelin’s technical and interpretive skills that he seems to dash off the 49-minute Concerto without breaking into a sweat. Thankfully there is none of that intrusive, mannered pianism that, for me at least, mars the playing of other ‘star’ players. In the first movement of the Concerto – Studies 8-10 of the Douze études dans tous les tons mineurs of 1857 – Hamelin seamlessly modulates from passages of white-hot intensity (often marked ‘tutti’) to cool oases of quiet lyricism (usually marked ‘solo’) in a way that is simply astonishing. The Hyperion engineers must take some of the credit for the success of this performance; I have long admired the balance they achieve between fine detail on the one hand and weight and warmth on the other. Here the cascades of sound – especially in the upper reaches of the keyboard – are captured with crystalline clarity, while the dense, colliding harmonies in the bass are equally well conveyed. The Adagio finds Alkan in one of those oases, resting after the rigours of the Allegro. Hamelin’s playing is as introspective as the music will allow, with occasional flashes of bravura writing. He judges the contrasting moods superbly, never allowing the big tunes to dominate or the quieter passages to meander or sound rhetorical. Indeed, Hamelin seems acutely aware of the music’s overall shape and competing inner voices, revealing the latter in a disarming and unselfconscious way. The ‘barbarous’ final movement may be something of a misnomer, but Hamelin is certainly up to its manic moments. Even the strange, fragmented passages sound all of a piece, clear and cogent, while at its most febrile his playing must surely threaten the piano. Could those colossal chords for the left hand ever have sounded more powerful, drenched as they are by those torrents in the right? Again Hamelin has the knack of tumbling from the millrace into quieter pools without pausing for breath. And even though virtuoso writing like this can so easily become a case of piling Ossa on Pelion, he manages to pull off the huge finale with great skill (and good taste).. In a concert this display would surely have the audience on their feet, abetting an encore. If that has you gasping in disbelief – or the neighbours banging on the wall – the other pieces should calm things down a bit. Alkan wrote four volumes of chants, Opp. 38 (two books), 65 and 67, using Mendelssohn’s Songs without words as his model. Starting with the sparkling little Vivante it’s clear we are in a different, more intimate, acoustic (London’s Henry Wood Hall). Once again the piano sound is beautifully judged, especially in the miniature Esprits follets (‘Goblins’) which scampers past in just over a minute and a half. 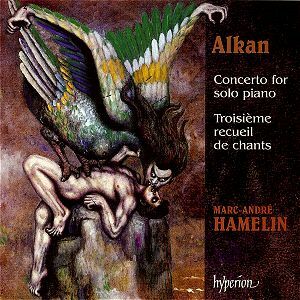 Outwardly the Canon finds Alkan in a more formal mood, yet still he adds those subversive harmonic and melodic flourishes that bewitch the senses. The Tempo giusto has something of Liszt’s pioneering Études d'exécution transcendante about it, although Alkan’s colour palette is even more exciting and varied. And then there’s that prescient passage at 3:00, which sounds remarkably like jazz. The more declamatory Horace et Lydie (supposedly based on a Horatian ode) harks back to the Concerto in terms of weight but Hamelin still manages to find a degree of delicacy at the outset. In the final Barcarolle, especially, his playing has a gentle charm, dreamy yet without ever losing that all-important sense of focus and clarity – a remarkable achievement. Not music one would listen to very often, perhaps, except to remind one of how a well-recorded piano should sound or how self-conscious and mannered some rival pianists sound in such repertoire. Jeremy Nicholas’s liner-notes are clear and informative but regrettably he repeats the apocryphal stories about the Le Ménéstrel obituary and Alkan’s supposed death under a falling book case, both since disproved. But rather than ransack the cupboard for any more superlatives I would simply urge you to go out and buy this disc at once.